The 415-HP SS is on its way out, but there's still time to buy one. 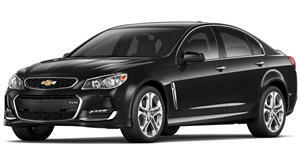 Only a couple of weeks ago we reported that the Australian-imported, V8-powered muscle sedan that is the Chevrolet SS is living on borrowed time. Australian production is ending very soon and GM won’t replace the SS, or its Down Under counterpart, the Holden VF Commodore. But if you still want to buy an SS, now is the absolute best time to do so. GM Authority first caught wind of the awesome deal Chevrolet is now offering: 20 percent off every SS through the end of this month. Do the math and that’s nearly $10,000 off the MSRP of $49,915. Put another way, you’re getting 415 hp for just under $40k depending on options. However, the SS wasn’t exactly as common as Chevrolet dealership lots as, say, Malibus or Impalas. It was and still is considered more of a niche model, and if you’re serious about buying one this month, you may need to look beyond your local Chevy dealer to find one, or even one with whatever features you prefer. For example, you can have the big RWD sedan’s 6.2-liter V8 paired to either a six-speed automatic with paddle shifters or a six-speed manual transmission. For the record, the mighty Dodge Charger SRT Hellcat can’t be had with a manual. 2017 will be the final model year for the Chevy SS, so once they’re gone, they’re gone. For good.